Below is a list of Australian Leaders of the Opposition. The Leader of the Opposition in Australian Federal Politics is a Member of Parliament in the House of Representatives. The position is held by the leader of the party not in government that has the most seats in the House. When in parliament, the Leader of the Opposition sits on the left-hand side of the centre table, in front of the Opposition and opposite the Prime Minister. The Opposition Leader is elected by his or her party according to its rules. A new Opposition Leader may be elected when the incumbent dies, resigns, or is challenged for the leadership. The Commonwealth of Australia is a constitutional monarchy with a parliamentary system and is based on the Westminster model. The term Opposition has a specific meaning in the parliamentary sense. It is an important component of the Westminster system, with the Opposition directing criticism at the Government and attempts to defeat and replace the Government. The Opposition is therefore known as the "Government in waiting" and it is a formal part of the parliamentary system. It is in opposition to the Government, but not to the Crown; hence the term "Her Majesty's Loyal Opposition". To date there have been 33 Opposition Leaders, 18 of whom have served terms as Prime Minister. 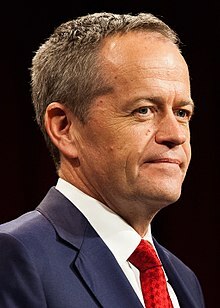 The current Leader of the Opposition is Bill Shorten of the Australian Labor Party, following an election of the new Parliamentary Labor Leader by caucus and ALP members on 13 October 2013. The current Deputy Leader of the Opposition is Tanya Plibersek of the Australian Labor Party, following her election on 14 October 2013 by the Labor Caucus. Tanya Plibersek is the fourth woman to hold the position of Deputy Opposition Leader. In the Australian House of Representatives, the Leader of the Opposition sits at the front table to the left of the Speaker's Chair (on the right-hand side in this photo). ^ Denotes an Opposition Leader who had previously been Prime Minister. ^ Denotes an Opposition Leader who later became Prime Minister. ^ Gough Whitlam refused to use the title Leader of the Opposition between the dismissal of his government in November 1975 and the first meeting of the new parliament in February 1976. During the election campaign in December 1975 he styled himself as the Leader of the Majority in the House of Representatives. ^ Maiden, Samantha (18 November 2010). "Altar egos clash over Wills and Babykins". The Australian. Retrieved 31 March 2011. ^ Jaensch, Dean (1997). The Politics of Australia. Melbourne: MacMillan Education Australia. p. 100. ISBN 0-7329-4128-8. ^ "A House for the nation". Commonwealth of Australia. Archived from the original on 30 August 2007. Retrieved 14 December 2007. ^ Gough Whitlam. "Whitlam Speeches – 1975 Election Policy Speech". Whitlam Dismissal. Archived from the original on 16 November 2006. Retrieved 12 April 2006. This page was last edited on 14 April 2019, at 07:45 (UTC).